When the list of directors involved with the Showtime cable series, "Masters of Horror", was announced, I was intrigued by the inclusion of Dario Argento and Takashi Miike. Argento at his best has been able to sustain an intensity that can be unbearable, as in the opening sequence of Suspiria. As it turned out, Argento's contribution to "Masters of Horror", Jenifer, had some of its violent imagery trimmed before its cablecast. While Jenifer was one of the better received episodes, I had to wonder if Showtime and an unaware American audience was ready for Miike. Those of us who are familiar with Miike were not surprised when it was announced that that for Showtime, there would be no show time for Imprint. Miike is not a filmmaker one watches unprepared. While some films are better than others, what is consistent throughout his work is how Miike loves to deliberately provoke the audience. Even the relatively benign Gozu features a low-level gangster taking a supposed "Yakuza attack dog", really someone's small pet, by the leash, and smash it against the sidewalk. The scene is absurd and brutally funny. For Miike, nothing is taboo either as subject matter or as something to be depicted on film. Imprint is based on a novel, Bokke Kyote by writer and actress Shimako Iwai, who has a small role in the film. Screenplay writer Daisuke Tengen is the son of Miike's mentor, Shohei Imamura. The story, about an American man, Christopher, who finds himself in a brothel in a Japanese island in the late 19th Century. A scarfaced prostitute tells Christopher about her life, also revealing the fate of Christopher's lost love, Komomo. The film is elegantly photographed with beautiful use of color, such as a long shot of a bare tree draped with red banners, or a river bank bordered with pinwheels. At the same time, Imprint features excruciating scenes of torture, involving long needles stuck under fingernails and in the mouth. While not as extreme as Miike's Ichi the Killer, it is still ugly to watch. What may have ultimately forced Showtime's hand was the depiction of a back country abortionist who disposes of fetuses in a river. At the beginning, Imprint had the promise of being as elegant and has horrifying as Miike's best film, Audition. Given a free hand, as it were, Miike undermines his art with increasingly over-the-top imagery that is less scary and more silly. There is also the question as to whether Miike should have made Imprint in English. 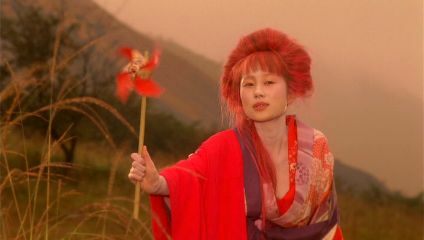 Youki Kudoh, the prostitute with the deformed face, has appeared in such films as Memoirs of a Geisha and Snow Falling on Cedars. The rest of the Japanese cast often is clearly struggling with English and requires close attention to what is said. Billy Drago may have had a better modulated performance had Miike understood English and the inflections of the language. I have mixed feelings about Imprint primarily because I was hoping that Miike would be introduced to a broader audience. Miike made exactly the kind of film he wanted to make, but lost an opportunity to make himself better known to those unfamiliar with this very unique filmmaker.